Socks at last | carpe diem! Finally, some knitting that pleases me. Those %@**! Socks are finished and a friend whose opinion I value considers them to be desirable objects, so that’s alright (I’ll have to knit her a pair, too). Those %@**! Blue Socks: Hipknits Sock Cashmere, pattern ‘Priscilla’s Dream Socks’ (subscriber download from Interweave Knits) with some modifications: knitted on two circs rather than dpns, and using different needle sizes; I don’t know K’s measurements, just her US shoe size, which is larger than mine. I made the large size but used smaller needles to produce a smaller sock that’s nonetheless slightly loose on my foot, and with a denser fabric that I hope will wear well. 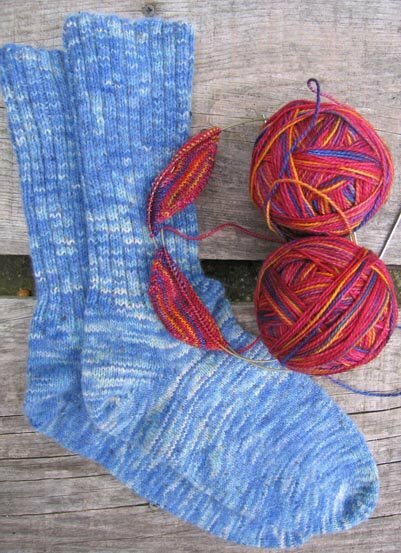 The entire foot was knitted on 2mm/US 0. I had a fair amount of difficulty with that short-row heel, so opted for a different toe, a standard 4point decrease finishing with my first serious exercise in grafting. I enjoyed it, really satisfying, thanks in part to these videos. And more knitting! I dithered about this scarf for far too long, given the time constraints. 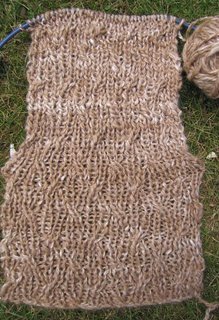 Started a pattern and ripped after 5 rows so often that the first bit of the first ball was left in the last swatch; precious though this handspun alpaca/silk is, it was in no condition to be on public display. Having decided I wanted cables, I was wrestling with the fact that almost all of the fabulous cabled scarf patterns are one-sided: the back has an interesting texture, but does not resemble the front OK, it does, it has to, but you know what I mean. Given that both sides of the scarf are always seen, this bothered me. Nora Gaughan’s ‘Here and There Cables’ in Scarf Style proved there was an elegant solution, but the pattern repeat was far too wide. I started playing with graph paper to make something smaller then, while browsing Socks, Socks, Socks for something else, I came across the ‘Ribble Socks’ pattern. Same reversible cables, smaller repeat. Inspecting the first 6 inches I couldn’t decide if I was making a mistake or a truly elegant item, but as the scarf grows longer I’m becoming more and more certain it’s the latter. This yarn is a treat to knit, and is teaching me to knit loosely to allow the handspun space to breathe. 4mm needles produced a fabric that’s too dense; 4.5mm makes something that looks like tree bark (alpaca/silk treebark, the softest trees you’ve ever encountered. Imagine the forest, with silk lace leaves…). Stretched as it will block the cable pattern shows more clearly and the looser fabric drapes beautifully. I think it will bloom when washed as the cashmere did, developing a halo of fine hairs and softening even more. I am *really* looking forward to seeing what happens and, if it’s as good as I think it might be I look forward to knitting with that yarn again. Lots. Some of the questions I didn’t answer… the fabric strips will be a knitted carpet. I’ve saved an old duvet cover, a silk shirt, and I’m watching his most ramshackle pair of jeans. Shades of blue to go on our bedroom floor (all blues and white with a polished wood floor). And alas, none of the dpns are smaller than 3.5mm. I wonder what I used them for? Was my subconscious dreaming of socks so far in the past? This entry was posted in Uncategorized on July 10, 2006 by sarahw. The handspun yarn/scarf is gorgeous. That’s some the good knitting work over there! I’m excited to see the finished product.As for the short row heel, it’s the only one I ever do. The first time or two is tricky, absolutely. I stuck to it and after my first whole pair of socks, I’d had some practice. (4 times doing the short row thing) Then I wore the socks. Ohhh. I said. Wow. They fit my feet better than anything else I’ve ever worn! I’m at the point now where I’ve memorized the pattern, I only use one needle size, not two, and I’ve made a couple of other alterations. I knit it over and over…maybe this is why there are so many kinds of sock heels and toes? to fit all the different knitters? (blush) I am exceedingly, embarrassingly pleased with the scarf, especially as it’s the first time I’ve not knitted directly from a pattern telling me what yarn and needles to use! I love the handspun, and it’s so different from any other yarn I’ve handled. I want to try more handspun, different handspun, I can see there’s a challenge to devising a design that makes it clear the irregularities are art. Simple designs, classic shapes. And I’m so glad you had to do heels more than once (misery loves company? ), but I win (or lose): those blue socks had *6* heels, and one is still not quite right. From reading blogs, some of the sock heel thing seems to be related to wear patterns; several people assert that the heelflap is easier to repair/reknit. I don’t know, I haven’t worn out any handknit socks yet!